Forced two-phase cooling is investigated for handling high power electronics and laser applications having high heat flux and iso-thermality requirements. Experimental re-sults are reported for minichannel heat sinks with and without enhanced boiling coatings showing increased heat transfer coefficients and high critical heat flux for coated versus uncoated surfaces. Optoelectronic devices and state-of-the-art high power lasers generate waste heat at characteristically high heat fluxes. Vertical Cavity Surface Emitting Lasers (VCSEL), for example, have been demonstrated with opti-cal power output upwards of 1kW/cm2 in continuous wave mode, and 4kW/cm2 in qua-si-continuous wave mode. The electrical to optical power conversion efficiency in such devices is limited to ~60% at present. As a result, large amounts of heat at high fluxes (multiples of 100W/cm2) are generated dur-ing their operation and need to be dissipated. Single-phase cooling using microchannel coolers (MCC’s) is the current approach to meet this need. High coolant flowrates are maintained in the microchannels to obtain the high heat transfer coefficients needed to maintain operating temperatures and desired temperature uniformity. These large coolant flows make MCC’s prone to erosion. The small hydraulic diameters of the channels (micrometer range) also requires large pres-sure heads to be sustained across the heat sinks and cannot be easily scaled up to ac-commodate larger device arrays. Due to these drawbacks, single-phase cooling becomes more challenging to implement especially as power densities increase. The use of boiling heat transfer for dissipat-ing high heat fluxes is an alternative to single phase cooling. Benefits include higher heat transfer coefficients compared to single-phase convection (lower thermal resistance) and excellent temperature uniformity, as boil-ing heat transfer occurs within a narrow tem-perature range close the boiling point of the coolant. sists of vapor and liquid at saturation. By controlling the pressure in the tank, the satu-ration temperature of the working fluid can be controlled. The preheater is used to con-trol the temperature of the subcooled liquid exiting the condenser to the desired liquid temperature or quality before entering the evaporator. Typically only small pumps with low flow rate and pressure head are required. This enables the use of lower flow rates compared to single phase cooling systems to dissipate a given heat load. Boiling heat transfer can be further improved by applying microporous coatings to the heated surfaces. Porous coatings enhance boiling performance due to increased number of nucleation sites resulting in a lower overall thermal resistance of the heat sink. In addi-tion, the coatings provide for a capillary-driven mechanism for liquid resupply to de-lay dryout associated with the Critical Heat Flux (CHF). The application of a mi-croporous coating can also suppress evapora-tor and system-level boiling instabilities (Semenic and You, 2011, 2013). 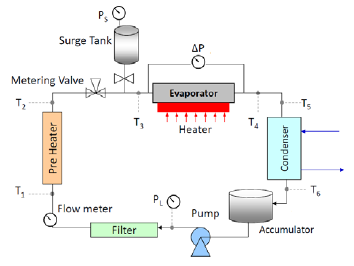 In this paper, an overview of the pumped two-phase cooling system is presented along with representative results on heat transfer coefficient and wall superheat obtained with and without boiling enhancement coatings. 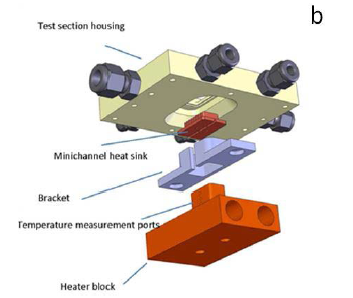 Figure 2: (a) Two-Phase test loop and (b) Heat sink and Heater block assembly. 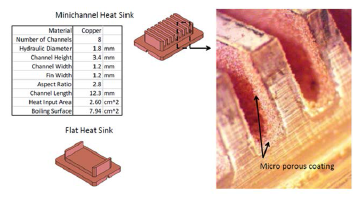 Figure 3 shows a representative copper mini-channel heat sink used in these experiments with microporous coating applied to the heat sink surface. Figure 3: Minichannel Heat Sink – geometrical pa rameters and application of microporous coating. The test section housing includes measure-ment ports where the absolute pressure (PX481A-300G5V Omega), differential pres-sure across the heat sink (PX2300-2DI Ome-ga), and the fluid temperature before and af-ter the heat sink are measured. Temperature is also measured at the inlet and outlet of the preheater and the condenser. The system pressure is controlled using the two-phase surge tank, and the preheater is used to con-trol the extent of subcooling upstream of the heat sink entrance. A small pump (Fluid-o-Tech Pump M42x30/l Kag Motor) is used to maintain liquid flow in the loop. Flowrate is measured using liquid turbine flowmeter (FTB-1400 Series Omega). Where tsubstrate is the distance from the heat sink base to the top of the coolant channels, ksubstrate is the thermal conductivity of the heat sink (copper), L is the channel length, Wchan-nel and Wfin are the channel and fin widths, respectively. With all dimensions and experimental parameters known, the above expression is solved for h.
Two different refrigerants: R134a and R245fa were considered. The system pressures and liquid-to-vapor expansion ratios are significantly different. The focus here how-ever is on performance of the coatings with comparison to baseline uncoated heat sinks. Microporous coatings were formed by sintering copper particles to the copper substrate in an inert atmosphere at prescribed temperature using a braze material. The resulting high-conductivity microporous coating has minimal thermal resistance. Typical coatings have a uniform thickness of ~35 – 70 μm. The particle sizes considered were in three different ranges: 125-149μm (-100+120mesh), 63-74μm (-200+230 mesh), <20μm (635mesh). Figure 3 shows a representative coated heat sink with copper powder coating. The heat transfer performance of the heat sink is quantified by the heat transfer coefficient (HTC) and wall superheat as a function of coolant heat flux, mass flux, and amount of subcooling (Tsat -Tin). 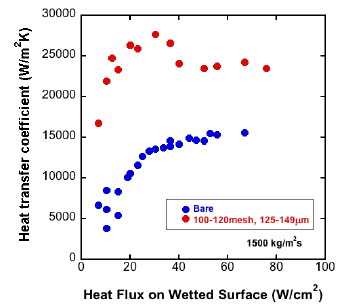 The heat flux and HTC calculations are performed using the wetted surface area, not the heated surface area. 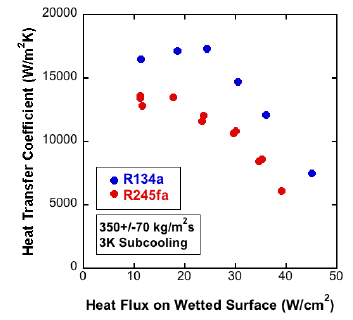 Figure 4 shows the HTC vs. applied heat flux for two refrigerants, R134a and R245fa, keeping other parameters fixed (mass flux, subcooling, heat sink, coating). The HTC is ~30% higher with R134a while trends are similar. Two-phase flow oscillations were also more pronounced in R245fa compared to R134a; the ratio of liquid to vapor density at 30°C is larger in R245fa (~130) than R134a (~30) and the system pressure using R245fa is considerably lower compared to R134a (R245fa – 11 psig, R134a – 97 psig saturation pressure at 30°C). The fluctuating pressure drop caused by periodic vapor generation/ blockage tends to have a greater impact on the system with lower baseline pressure (R245fa). Figure 5: Heat Transfer Coefficient as a Function of Mass Flux on Mini channel Heat Sink, Refrigerant: R134a. Figure 5. At the lower heat flux values, the heat transfer coefficient is relatively insensitive to the mass flux, suggesting that the convective contribution to the flow boiling is not very significant, i.e., heat transfer is dominated by nucleate boiling. For the larger value of heat flux (50W/cm2), the heat transfer coefficient is lower at low mass flux and increases with increasing mass flux. This suggests that local or transient dryout may occur at low mass flux. As the mass flux increases, the vapor quality decreases while the increased liquid velocity promotes detachment of the vapor bubbles from the surface. If the mass flux were further increased beyond the data presented, the heat transfer coefficient is expected to continue to increase with increasing mass flux until fully developed nucleate boiling occurs, at which point the heat transfer coefficient should asymptote to a constant value. Figure 6: Heat Transfer Coefficient a Function of Heat Flux for Minichannel Heat Sinks, with and without Microporous Coatings, Refrigerant: R134a, Avg Subcooling (bare): 3.0°C , (100-120 mesh): 2.1°C . 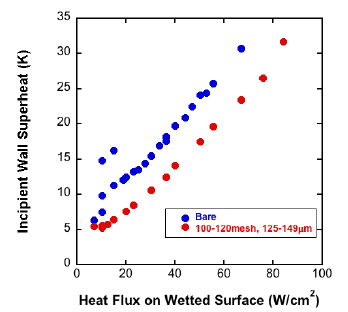 Figure 7: Incipient Wall SuperHeat as aFunction of Heat Flux for Flat(a) and Minichannel (b) Heat Sinks, with and without Microporous Coatings, Refrigerant: R134a. the application of coating enhances thermal performance; higher HTC values and lower wall superheat for the coated surfaces com-pared to uncoated surfaces at the same heat flux. All other parameters held constant, a heat-generating device mounted on a two-phase heat sink with microporous coating will be cooler, when compared to an otherwise identical heat sink without coating. Additional results comparing thermal performance with different microporous coatings will be presented. Lastly, it should be mentioned that the coating thickness was less than 100mm, which is very small compared to the hydraulic diameter of the channels (~ 3mm). As such, the coating does not obstruct the flow in the channel or significantly add to the friction on the channel walls. 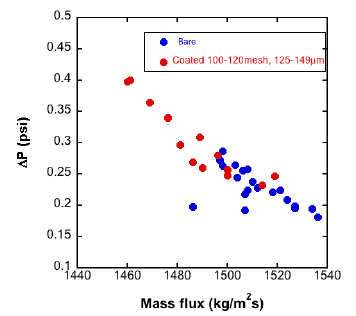 A representative plot of pressure drop versus mass flux (in the range of 1500 kg/m2 s) for coated and uncoated heat sinks is shown in Figure 8, where similar pressure drops (~ tenths of a psi) were measured. Figure 8: The microporous coating does not signifi cantly affect the pressure drop in the channel as shown in pressure drop measurements. The boiling and flow stability performance of R134a was compared with that of R245fa, showing that R134a has a 30% higher HTC. It is also less susceptible to two-phase flow instabilities for the cases considered. 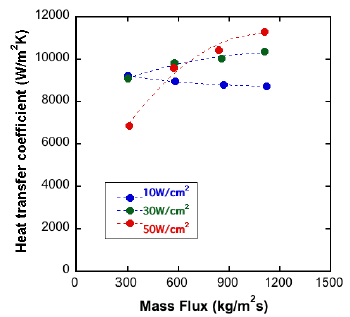 The dependence of the boiling heat transfer coefficient to the input heat flux was also evaluated for a fixed mass flux as well as for a range of mass fluxes for two heat flux values. The benefits of using microporous coatings were further presented showing coated surfaces have larger heat transfer coefficients and lower superheats relative to their uncoated counterparts. Overall, pumped two-phase cooling for high heat flux thermal management applications offers an effective alternative to single-phase cooling in MCC’s. In our work using the loop described, heat fluxes as high as 320 W/cm2 (~105 W/cm2 on the wetted surface) were removed while maintaining the heat sink temperature below 90°C (condenser temperature of 30°C). This work was supported by funding from the National Science Foundation (Grant 1127293). Authors thank Dr. T. Semenic for his valuable contributions to the early stages of the project. Chang, J. and S. You (1997). “Enhanced boiling heat transfer from microporous sur-faces: effects of a coating composition and method.” International Journal of Heat and Mass Transfer 40(18): 4449-4460. Chang, J. Y. and S. M. You (1997). “Boil-ing heat transfer phenomena from mi-croporous and porous surfaces in saturated FC-72.” International Journal of Heat and Mass Transfer 40(18): 4437-4447. Dhir, V. K. (1998). “Boiling Heat Transfer.” Annual Review of Fluid Mechanics 30(1): 365-401. Forster, H. K. and N. Zuber (1955). 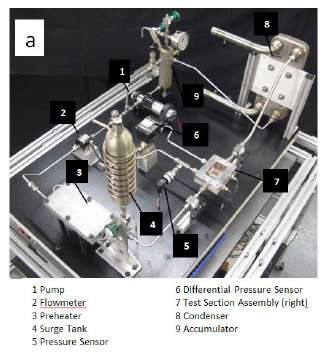 “Dy-namics of vapor bubbles and boiling heat transfer.” AIChE Journal 1(4): 531-535. Kandlikar, S., S. Garimella, et al. (2005). Heat Transfer and Fluid Flow in Minichan-nels and Microchannels, Elsevier Science. Lee, P.-S. and S. V. Garimella (2008). “Sat-urated flow boiling heat transfer and pressure drop in silicon microchannel arrays.” Interna-tional Journal of Heat and Mass Transfer 51(3): 789-806. Liter, S. G. and M. Kaviany (2001). “Pool-boiling CHF enhancement by modulated po-rous-layer coating: theory and experiment.” International Journal of Heat and Mass Transfer 44(22): 4287-4311. Qu, W. and I. Mudawar (2003). “Flow boil-ing heat transfer in two-phase micro-channel heat sinks––I. Experimental investigation and assessment of correlation methods.” Interna-tional Journal of Heat and Mass Transfer 46(15): 2755-2771. Rohsenow, W. M. (1952). “A method of correlating heat transfer data for surface boil-ing liquids.” Transactions of ASME 74: 969-976. Semenic, T. and S. M. You (2013). “Two-Phase Heat Sinks with Microporous Coat-ing.” 9th International Conference on Na-nochannels, Microchannels, and Minichan-nels, Edmonton, CA, June 19-22, 2011. Semenic, T. and S. M. You (2013). “Two-Phase Heat Sinks with Microporous Coat-ing.” Heat Transfer Engineering 34(2-3): 246-257. Thome, J. R. (2006). “State-of-the-art overview of boiling and two-phase flows in microchannels.” Heat Transfer Engineering 27(9): 4-19.